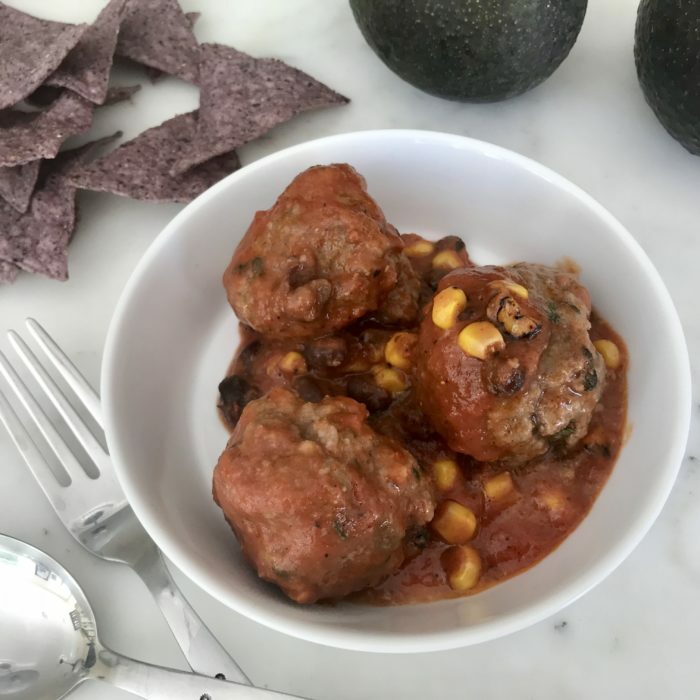 I am adding spices and veggies to give these meatballs a Mexican twist. You can enjoy these on top of Mexican rice, cauliflower rice, on its own or even in a tortilla, whatever suits you. I am adding black beans and corn to make this a complete meal. Combine, the meat, cilantro, onion, garlic, cumin, paprika, egg and bread crumbs in a large bowl. Mix with a fork without squishing it too much until nicely combined. Using a ice cream scooper, form the meatballs (there should 12-15). Heat up 2 tbsp of olive oil (or ghee) in a skillet and brown the meatballs on each side for 3-4 minutes. Pour the enchilada sauce, add the corn and black beans and simmer for 15 minutes. Enjoy these with some chopped avocado, sour cream, cheese or on its own! Enchilada sauce: Combine 2 tbsp of flour with 2 tbsp of olive oil, 1 tsp of cumin and 1 tsp of paprika. When it forms a thick paste add 1 cup of strained tomatoes and 1 cup of water, some salt and pepper and leave it to simmer for 10 minutes.